I have been researching Robert Louis Stevenson in preparation for my forthcoming review of PKD's Library of America release. The connections between these two authors are fascinating. 'The Strange Case of Dr Jeckyll and Mr Hyde' was initially written as a lurid thriller, but Stevenson's wife famously burned the manuscript forcing him to begin again. He composed the next draft in a three-day marathon writing session (sound like anyone we know?). The second draft of the story was far more "literary" for lack of a better term. In it, Stevenson created an avatar for the Victorian unconscious mind. The novella delivers more than just Gothic suspense; it personifies the discoveries Freud was making about human nature at the same time. "I had learned to dwell with pleasure, as a beloved daydream, on the separation of these elements [good and evil]. If each, I told myself, could be housed in separate identities, life would be relieved of all that was unbearable; the unjust might go his way, delivered from the aspiration and remorse of his more upright twin; and the just could walk steadfastly and securely on his upward path." "The power of 'Jeckyll and Hyde' is that it resists simple allegory. Good and evil shift from face to face, and Stevenson wears all of them in this story. Isn't he Hyde's secret sharer? Sickly and rebellious, he destroys his father's portrait by becoming an artist rather than an engineer. 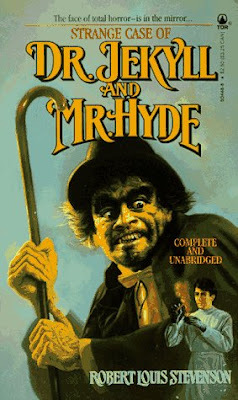 'Dr Jeckyll and Mr Hyde' was written under the fever of a man trying to declare his own identity, and I can't help but think that part of Hyde was that pale scribbler in Stevenson, screaming to come out, a "murderous mixture of timidity and boldness" that all good writing is about."